Jonathan Powell, formerly the chief of staff of British Prime Minister Tony Blair, has done the impossible. He has written an article for The Guardian that is almost entirely correct yet utterly wrong. But he’s not a fraction as naïve as you might think. He gets pretty much everything right until he asserts that we’ll have to talk to ISIS eventually. He’s not the kind of guy who thinks wars can be ended on the Dr. Phil show. He doesn’t believe diplomacy will ever convince a genocidal terrorist army that’s massacring innocent people on three continents to join the civilized mainstream. He recognizes that bombing ISIS is necessary. He also realizes destroying ISIS will require boots on the ground. But whose? Kurdish militias do very well in battle, but they’re neither equipped nor willing to conquer or liberate the vast swaths of Arab territory. And Powell realizes that Iranian-backed Shia militias like Hezbollah are out of the question for entirely different reasons. Unlike the Kurdish People’s Protection Units, Iranian militias are themselves terrorist organizations. Sunni militias in Syria, meanwhile, are mostly unwilling to fight ISIS until they first drag Bashar al-Assad out of his palace in Damascus. So he thinks we’ll have no choice but to talk to ISIS at some point. What on earth would we say? Well, he acknowledges that we have nothing to say to each other right now, but he thinks we’ll eventually think of something once everyone realizes there is no military solution. There is virtually zero appetite in the West right now to launch any kind of rerun of the Iraq war. Another 9/11-style attack could change public opinion in an instant, of course. A series of Paris-style attacks in New York City or anywhere else in America might have the same effect over time. But in the meantime, we’re in a holding pattern. The thing about holding patterns is that they’re temporary. At some point, something is going to change even if it takes a l-o-n-g time. Perhaps Assad will be overthrown and Sunni wrath in Syria will shift from the capital and toward the deranged “caliphate” out in the desert. Perhaps the civilian population in ISIS-held territory will finally say enough and fight the bastards themselves. Maybe Russia will say eff it and go in there whole hog. Maybe something totally unpredictable will happen. It’s the Middle East we’re talking about, after all. Even if the holding pattern lasts years, we still won’t be able to resolve the ISIS problem by talking to ISIS because we’ll have no more to say at that time than we have today. ISIS is a genocidal army. It murders Yezidis, Shia Muslims, Christians, Alawites and Westerners not because of anything they’ve done but because of who they are. There is no conceivable political solution to be had with these kinds of people. They will continue to kill until they are no longer able to kill. That’s how it always is with genocidaires. ISIS is not the Irish Republican Army. It is not even Hezbollah. It has far more in common with the Nazis. And we didn’t resolve the Nazi problem by talking. That’s what ISIS wants. They’re not even trying to hide it. History has proven over and over again that fighting can provide an answer all by itself. Not always. But sometimes. And sometimes there’s no other option. The Nazi regime no longer exists. The Empire of Japan no longer exists. Moammar Qaddafi’s regime no longer exists. Saddam Hussein’s Arab Socialist Baath Party no longer exists. Thanks to Vietnam’s invasion of Cambodia in 1977, Pol Pot’s Khmer Rouge government no longer exists. At some point—lord only know when—ISIS will no longer exist. And it won’t happen because anybody talked them out of existence. Is it possible to understand Ben White’s view that the Guardian is biased against Palestinians? There is a role for talking to ISIS, but it cannot come from the infidel West. ISIS is merely a symptom whose underlying cause is the failure of respected Muslim theological institutions (for instance, Al Azhar for the Sunni and Qom for the Shia) to mount any credible exegetical counter to Islamic jihadist theory. Rather than tell the infidels that the acts of ISIS are “against Islam,” they need to argue with the theological case to the jihadists in terms they recognize. That this has never happened is telling. It may be that Islam simply does not possess the intellectual tools to convince jihadists that they are misinterpreting their holy texts. It may be that they recognize the jihadists’ interpretation is as valid as any other in mainstream Islamic thought but cannot bring themselves to admit it publicly. It may also be that any interpretation that undermines ISIS will also undermine terror groups that have wide acceptance, such as Hamas and Hezbollah. Whatever the reason, only Muslims can combat the underlying ideas that nourish groups like ISIS. Otherwise, just as ISIS replaced al Qaeda, there is every reason to believe that something else will replace ISIS. That implies some kind of agency amongst Muslims, something that has never existed. Remember, they are victims, even when they are cutting people’s heads off. Victims of oppression, imperialism and colonialism, etc. If there is a problem in the islamic world, then it must be the fault of the West, the US and the Zionists and because of the creation of the state of Israel. Asking muslims to clean up their house? The horror! It’s not about making them think twice. It’s about making them die once. I think, but am not sure, that we should see this not so much as a fight against people who have a different opinion. but more as a fight against people who are mentally deranged. I use the term “mentally deranged” not as a nasty epithet but as a clinical assessment of people who have a vision that puts their environment at risk. If you see the situation thus, you will realise that you cannot talk with the patient, since the patient is not sane. All you can do is put him in a straight-jacket, to stop him injuring himself or other people. In this case the straight-jacket involves actually killing people, but sometimes there is no other way of protecting the community from the actions of mentally deranged people. Just as you cannot tell a dog suffering from rabies to lie down – you have to shoot the animal. Not as a punishment, but as a way of protecting the community. I think the comparison that was made to the Nazis in the article is very relevant. In many ways, the Nazis were mentally deranged, and again any talk of “Peace in our time” as in München in 1938, shows that a rabid dog has to be shot if the community is to be saved. “ISIS is a genocidal army. It murders Yezidis, Shia Muslims, Christians, Alawites and Westerners not because of anything they’ve done but because of who they are. There is no conceivable political solution to be had with these kinds of people. They will continue to kill until they are no longer able to kill. Read it again: There’s no secret channel for negotiations with this lot. Powell has not mentioned Afghanistan. The same ISIS is there creating hell this last weekend. “Bombing” hasn’t been even contemplated in Afghanistan. Apart from the Times and a couple of others, I have not seen one report on the TV over the weekend about what’s going on there in any detail. Now Google Isis in Uzbekistan and in Kazakhstan…. 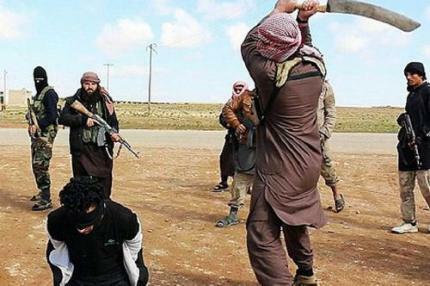 Talk to ISIS: Please don’t chop off my…..ackkkkkkkkk argggggggggg…..gasp.